So I may have missed a couple of boxes out… but here’s February’s box for 2017! Here’s all the goodies for February!! My initial reaction is I love the box, the green leafy vibe is my favourite. This brush is so SOFT! I wish I had more makeup applying talent to be able to fully utilise this brush because I could not for the life in me get enough control to be able to apply a colour in the crease and inner lid! If anyone is willing to each me… I’d LOVE to learn how to do makeup, but especially eye makeup. These are my favourite colours in an every day pallet! I’m not usually a big eyeshadow-wearer, however I have worn these quite a lot, especially the first couple of lighter shades. They do have a slight shimmer on them and I would like to try something more matt, however I have very limited talents when it comes to makeup so maybe I’ll just settle for this for now, however if anyone has any matt eye shadow pallets that they would recommend, please do! So I tried this sheetmask one night after a particularly stressful day and just needed a bit of TLC. I don’t know whether it’s my super sensitive skin or the fact it’s a new product that I’ve not tried before but it made me break out and I wanted so much to love it! I hardly ever get spots, only when I’m stressed (given, I was that day) but never where or the amount I got the day after having this on my face for 25 minutes – as instructed! I don’t know, maybe it was too oily for me or something and it smelt great but I won’t be trying this again and it’s kind of scared me trying any kind of sheet masks if that’s how my skin is going to respond! All in all, I really enjoyed this months box but honestly, it wasn’t my favourite! I definitely have missed the usual skincare things this month, especially with it being February! 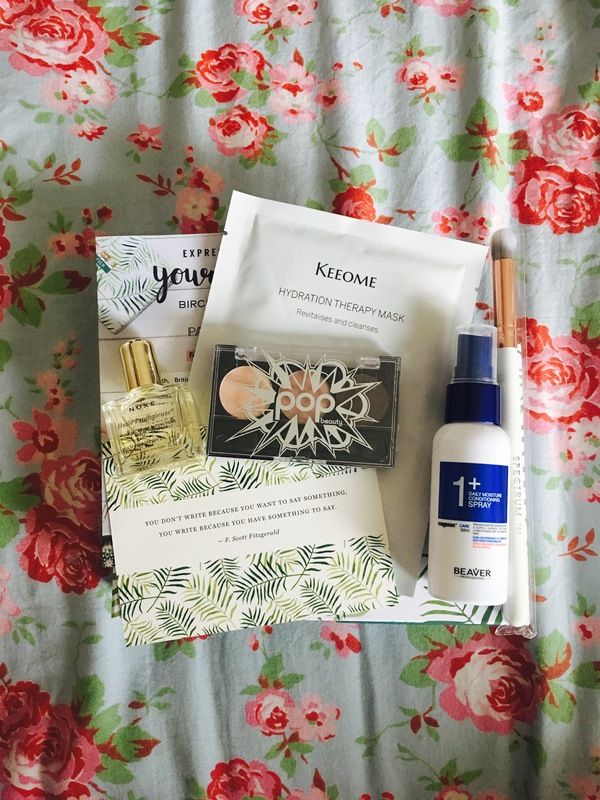 I’ve been considering maybe subscribing for My Little Box as well or instead of BirchBox, although I’m not 100% decided! If anyone has any recommendations for any other makeup/skincare or just any subscription box please do leave a comment! Previous Recent Purchases from Sales! Love Birch Box designs and this looks like a fab box. I can’t get enough of the NUXE Oil; for me it sunk it super quickly, and WOW getting a Spectrum brush! Spectrum brushes are a great brand so definitely a good tool to start your makeup brush collection! For a matte palette I’d definitely recommend a naked basics palette from Urban Decay. They’re about £20 and they’ve got the main mattes you’ll ever need! I swear by mine. I haven’t been tempted to subscribe to Birchbox for Bloody ages and it’s been almost 2 years I think since I last had one! This one is so tempting to me, I’ve seen so many nice things in this months box, that POP shadow looks great, as does the conditioning spray, but I don’t like that Birchbox seems to have so many product variations for each box, I always felt like I drew the short straw and other people always had the items I wanted! I must keep a lookout for that brand as I’ve never even heard of it before! I saw on your Instagram! I love all the designs they’ve done so far, I bet your wedding stationary is lovely!